With just 15 units, this is the smallest sample group therefore there are many quarters (sometimes years) with no sales activity. Each "blip" on the graph represents a single sale. The whipsawing in the graph also demonstrates the vast differences in condition and view (from zero to a peek-a-boo ocean sliver). Coincidentally, in 2010 we saw units 106 and 306 change hands. 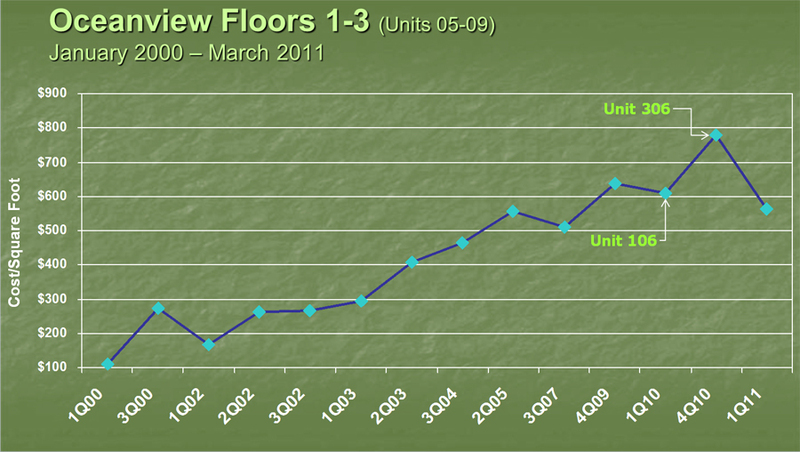 These sales show how critical location is on these floors. Buy the same token, the very first and last blips are the same unit (105). As a percentage, this unit returned the most impressive gains over the period. Clearly, the strategy of buying the least expensive home in a good neighborhood (or building) has worked for these owners (part of the increase is the result of a renovation done during the decade).